The United States, for decades a beacon for refugees and displaced persons from across the world, is retreating further from its leadership role in global resettlement. This year saw an historic reduction in the number of refugees allowed to resettle in the US and next year will be similar. The number 62 says a lot about the Trump administration’s policy on refugees – it’s the number of Syrian refugees fleeing the civil war who were resettled in the US in the fiscal year that ended in September. In the final year of the Obama administration, that number was 12,000. This is part of the current White House’s efforts to cut immigration overall. Mostly refugees to the US are coming from Africa or from Europe and in particular countries that were part of the former Soviet Union, such as Ukraine. An average of 95,000 refugees have been admitted to the US annually since the Refugee Act of 1980 was adopted. Republican presidents Ronald Reagan and George H Bush set the highest cap for refugees, at 140,000 and 142,000 respectively. Also, the entire infrastructure and framework of organisations that help resettle refugees in the US is being dismantled. The nine non-government organisations that are federally funded to do this work based on the number of refugees arriving have had to lay off staff and drastically cut back their budgets. 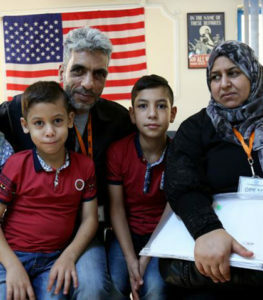 Refugee advocates say they would not be surprised if the resettlement program has ceased to exist by the end of the Trump administration if there isn’t an intervention by the US Congress to change things. The White House has given several reasons for the cuts. It has cited security concerns and also that it is giving money to countries that are hosting refugees closer to home. But the Trump administration has also made cuts to other legal migration pathways, including limiting visas for high-tech workers, tougher security screening for green card holders and cancelling temporary protected status (TPS). Advocates say about 500,000 people could now potentially be subject to deportation. Since the beginning of the Trump administration about 35,000 TPS visa holders have crossed into Canada, swamping that country’s immigration system. This has become a wedge issue for Prime Minister Justin Trudeau with the majority of Canadians now believing it has become a crisis. Advocates say this is in danger of poisoning public conversations and eventually leading to violence towards asylum-seekers and growing xenophobia both in Canada and the US. The US has historically been a country that was welcoming to people fleeing conflict but the Trump administration has entirely reshaped that role and, with it, the US’ reputation. On another level, the courts in the US have stopped some of the Trump administration’s more extreme agenda but advocates say the nation’s refugee programs have been severely weakened and will have to be rebuilt if a future administration wants to increase the numbers of refugees it accepts. With UN global estimates of refugees currently at 25 million – and half of them children – the US program cuts have seen refugee resettlement spots dwindle dramatically. But advocates say displaced people will continue to hire smugglers, board dangerous boats, cross frontiers, slip over borders because they are seeking safety.